Introduction: Previous studies evaluating home-based rehabilitation service (HBRS) merely focused on the period immediately after the patients’ discharge from hospitals. The present study focuses on HBRS that covers clients who have not been recently hospitalized. HBRS aims to meet older clients’ rehabilitation needs and support their caregivers in the community. This study intended to evaluate the impact of HBRS on the older clients’ health outcomes and hospital services utilization, and caregivers’ strain in providing care for clients. Methods: This study used a matched-control quasi-experimental design with a 3-month follow-up to evaluate HBRS. The health outcome measures used for the older clients included Elderly Mobility Scale, Timed Up and Go test, Modified Barthel Index, Lawton’s Instrumental Activities of Daily Living Scale, Mini-Mental State Examination, and World Health Organization Quality of Life Scale, Short Form, Hong Kong version (WHOQOL-BREF [HK]). Meanwhile, the Caregiver Strain Index was used to measure the caregivers’ caregiving strain. Data on clients’ hospital services utilization 3 and 6 months before and after the study were also collected and evaluated. Results: The final sample consisted of 122 pairs of older clients and caregivers who live in a community in Hong Kong. In the follow-up after 3 months, the intervention group showed immensely substantial improvements across all the health outcome measures compared with the control group. The intervention group also demonstrated substantial reduction in the clients’ hospital services utilization compared with the control group. However, no significant differences in the clients’ hospital services utilization exist between the two groups in the follow-up after 6 months. Conclusion: HBRS of this study is an effective intervention service to improve health outcomes and reduce hospital services utilization among older people living in the community. Moreover, HBRS of this study was effective in reducing the caregivers’ caregiving strain. The HBRS evaluated in this study is a nonprofit making community rehabilitation service that receives referrals from various sources, including hospitals, community services, outpatient departments/clinics, and general practitioners in the community, for the provision of rehabilitation service at the client’s home. These referrals are not necessarily for clients who are immediately discharged from hospitals. The major characteristics of HBRS are as follows. First, HBRS providers have an office in the district hospital of its catchment area and they are appointed by that hospital as honorary staff members, thereby enabling them to access the client’s medical records and communicate closely with hospital staff members to promote the client’s rehabilitation. Second, HBRS also establishes close connections with community health and social services providers to assist the client to live independently at home. Third, HBRS adopts a person-centered care approach, in which the therapist provides professional advice, while the client identifies personal goals in the rehabilitation process. With respect to the client’s preferences, the therapist has the professional autonomy to schedule home visits to provide tailor-made services that will address the former’s individual needs. Moreover, the therapist also supports the family caregiver by providing caregiving knowledge and teaching skills pertinent to the client’s health condition. Fourth, networks of the HBRS therapists across hospitals and the community will enable them to act similar to case managers who can refer clients or caregivers to the appropriate health or social resources. Compared with Mas et al,6 Sahota et al,7 and Karlsson et al,8 the current study’s HBRS covers clients who have not been recently hospitalized and includes a larger range of clients who suffer from various health conditions, such as cardiovascular diseases, musculoskeletal problems, neurological problems, respiratory problems, cancers, and falls. The present study aimed to evaluate the impact of HBRS in terms of older clients’ health outcomes and hospital services utilization, as well as caregivers’ strain in providing care for clients. This study used a matched-control quasi-experimental study design that consists of a baseline and follow-up survey after 3 months. The intervention group clients were provided with a home-based one-on-one rehabilitation program supported by experienced and registered physiotherapists, occupational therapists, and rehabilitation assistants. The duration of rehabilitation was not standardized but depended on the client’s progress, which is often within 3–6 months at 45 minutes per session. Individualized therapy sessions involved physiotherapy or occupational therapy such as various types of exercise training (eg, muscle strengthening and balance exercise), mobility training, training on basic and instrumental activities of daily living, pain relief therapy, chest physiotherapy, rehabilitation aids prescription and training, home safety assessment and modification, and cognitive and memory training. Apart from the training given to the client, caregivers were also provided education and skills training. The payment for each therapy session was USD10. The first HBRS visit to the client at home was scheduled within 10 days (or 3 days for urgent cases) after referral. In the course of rehabilitation, the HBRS staff members could make necessary referrals for the client or caregiver to a hospital department or a community service center. The control group clients did not receive HBRS or any other active rehabilitation service. Baseline demographic data were collected from the clients and caregivers. The health services utilization of the client, including numbers of Accident and Emergency Department (AED) attendance, unplanned hospital admissions, and bed days were retrieved from their medical records 3 and 6 months before and after the study, respectively. A baseline survey was carried out via the validated scales within 5 days before HBRS for the intervention group and within 5 days from the recruitment day for the control group. A follow-up survey using the same scales was performed after 3 months. Data collection was conducted via face-to-face interviews with the clients and their caregivers by a trained research assistant (RA) of this study. The 7-item Elderly Mobility Scale (EMS) was used to assess the client’s level of mobility; EMS has been validated among the older Chinese population in Hong Kong.23,24 The possible scores range from 0 to 20, in which a higher score indicates a higher level of independence in mobility. The Timed Up and Go (TUG) test, which has a high interrater reliability (intraclass correlation >0.9) and satisfactory validity,25,26 was used to assess the client’s ambulatory ability. TUG involves a measurement of the time in seconds. The client, who wears regular footwear and uses customary walking aid, is asked to stand up from sitting on a standard arm chair, walk 3 m, turn, walk back to the chair, and sit down. Lesser time represents a better ambulatory ability. The Chinese version of the 10-item Modified Barthel Index (MBI) was used to assess the client’s physical functioning in terms of personal hygiene, bathing, feeding, toileting, stair climbing, dressing, bowel control, bladder control, ambulation, or wheelchair and chair–bed transfer. Accordingly, a higher score indicates a higher level of independence in the physical activities.27 The Chinese version of MBI, which has scores ranging from 0 to 100, was shown to have good internal consistency (Cronbach’s alpha =0.93).28 The Chinese version of Lawton’s Instrumental Activities of Daily Living Scale (IADL) consists of eight items: taking medication, meal preparation, phone use, laundry, ordinary housework, managing finances, shopping, and transportation. This version was used to assess the client’s instrumental activities of daily living and was validated among the Hong Kong older people.29,30 Lawton’s IADL score was computed based on the eight items using a 3-point scale (0, 1, and 2). The scores range from 0 to 16, with a higher score representing a higher level of independence in performing instrumental activities. The Hong Kong-Chinese version of the 28-item WHO Quality-of-Life Scale (WHOQOL-BREF) was used to assess the clients’ subjective report on their quality of life and health in the last 2 weeks.32 WHOQOL-BREF has acceptable psychometric properties with Cronbach’s alpha coefficients ranging from 0.67 to 0.79 and test–retest reliability coefficients ranging from 0.64 to 0.90.33 Each item is rated on a 5-point Likert scale and a higher score indicates a higher level of quality of life. The 28 items include an item on overall quality of life (score range 1–5), another on the overall health (score range 1–5), and the remaining 26 items are grouped into four domains (ie, physical, psychological, social, and environmental health). Each of the domain and scale (total) scores were transformed into 0–100, in accordance with the scale manual. The caregiver’s caregiving strain was measured using the Chinese version of the 13-item Caregiver Strain Index (CSI), which has been validated in a group of Chinese caregivers (N=223) with Cronbach’s alpha=0.91.34 The items require a yes or no response. The possible scores range from 0 to 13, with a higher score indicating a higher level of caregiving strain. The SPSS version 24.0 (IBM Corporation, Armonk, NY, USA) was used for data analysis. The characteristics at baseline were compared using either the t-test or chi-square test. 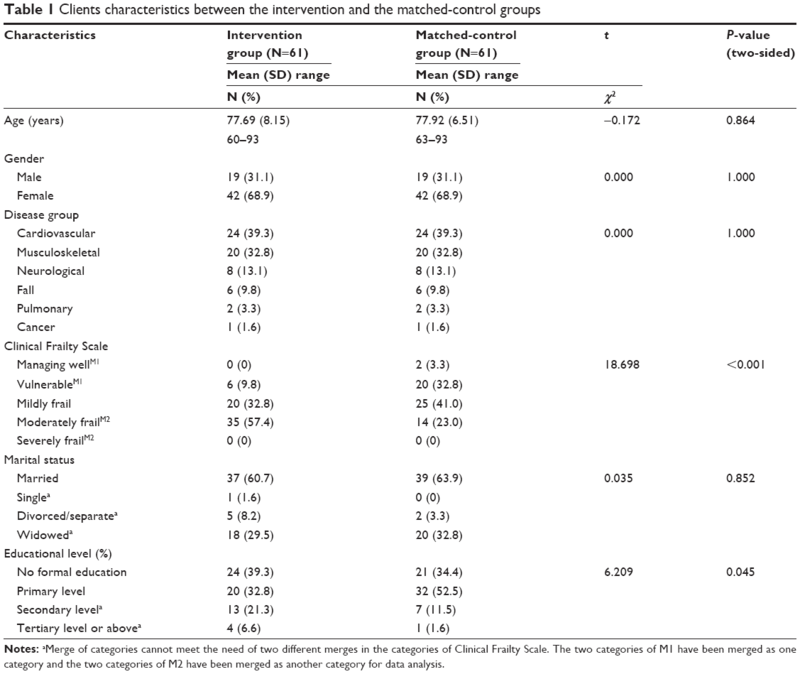 One-way between-groups ANCOVA was used to compare the outcome measures between the intervention and control groups with adjustments for the potential confounding variables. All statistical tests were two-sided and a P-value <0.05 was considered statistically significant. This study was approved by the Joint Chinese University of Hong Kong – New Territories East Cluster Clinical Ethics Research Committee, The Chinese University of Hong Kong, and the Hong Kong’s Hospital Authority. Moreover, informed written consents were obtained from the participants before the implementation of the study. The RA explained the objectives and the voluntary nature of the study to the participants, who were given time to ask questions. The final sample comprised 122 pairs of clients and caregivers, with 61 pairs each in the intervention group and the control group. Between September 1, 2015 and September 30, 2016, 80 pairs of eligible clients and caregivers in the intervention group and 91 pairs in the control group agreed to participate in the study (Figure 1). In the intervention group, five clients (6.3%) passed away, one pair of client and caregiver (1.3%) lost contact, and one pair (1.3%) refused follow-up. Hence, a 8.9% attrition rate was recorded. Among the remaining 71 pairs of clients and caregivers in the intervention group, 10 pairs (14.1%) were unable to match with a pair of the control group, thereby leaving a total of 61 pairs (85.9%) for the final analysis. In the control group, two clients (2.0%) passed away, seven pairs of clients and caregivers (6.8%) missed the follow-up and eleven pairs of clients and caregivers (10.8%) refused follow-up; hence, there was a 19.6% attrition rate. Among 82 pairs of clients and caregivers in the control group, 21 pairs (25.6%) were unable to match with a pair in the intervention group, thereby leaving a total of 61 pairs (74.4%) for the final analysis. Figure 1 The flow of participants in the study. Abbreviations: MMSE, Mini-Mental State Examination; HBRS, home-based rehabilitation service; FU, follow-up. Tables 1 and 2 show the baseline characteristics of the participants. No significant differences in terms of age, gender, disease group, and marital status were observed between the clients in the two groups. However, clients in the intervention group were frailer and had a higher educational level compared with those in the control group. Meanwhile, no significant differences in terms of marital and employment statuses were observed between the caregivers in the two groups. However, those in the intervention group were significantly younger and more educated. Moreover, the majority of them were females. Notes: aMerge of categories cannot meet the need of two different merges in the categories of Clinical Frailty Scale. The two categories of M1 have been merged as one category and the two categories of M2 have been merged as another category for data analysis. Notes: aMerge of categories for the chi-square test; percentages may not add up to 100% owing to rounding off. The frequency of the HBRS therapy sessions provided to the intervention group ranged from 2 to 26 sessions with a mean frequency of 8.52 (SD=4.65) in the period from baseline survey to the follow-up survey after 3 months. The median and mode frequencies were 7 and 6. The majority of the clients (N=42; 69%) received 6–10 therapy sessions. The variability in the number of therapy sessions was influenced by the clients’ rehabilitation needs and physical tolerance. For example, clients with greater impairment may receive more therapy sessions owing to the higher need for rehabilitation training, whereas frail clients might receive fewer sessions because of lower physical tolerance for rehabilitation training. Clients would have two sessions if they only required home modification service. In addition, caregivers with a higher ability in assisting the client for rehabilitation training may reduce the number of therapy sessions. Table 3 shows the results of the health outcomes after 3 months. 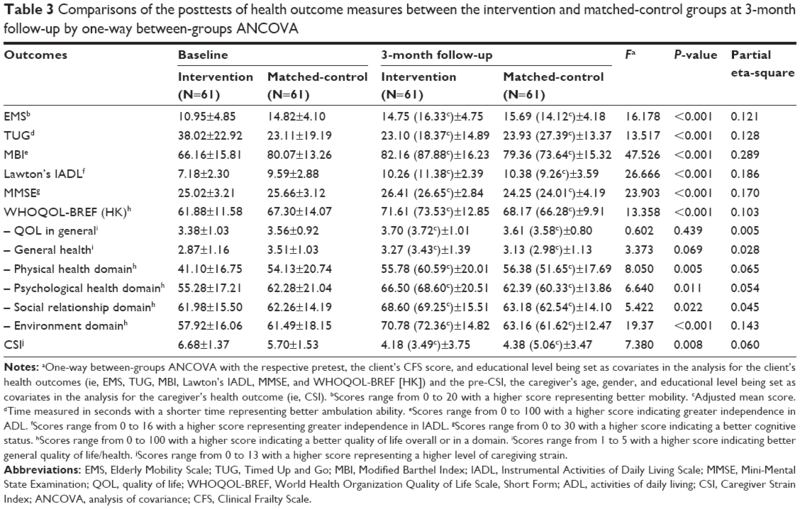 The one-way between-groups ANCOVA was used to compare the posttests of the clients’ health outcomes and control for the respective baseline dependent variable, frailty (ie, CFS score), and educational levels owing to the variation between the two groups. Compared with the control group, the intervention group demonstrated significantly higher adjusted mean scores in mobility (ie, EMS posttest), physical activities of daily living (ie, MBI posttest), instrumental activities of daily living (ie, Lawton’s IADL posttest), cognitive functioning (ie, MMSE posttest), and the overall quality of life (ie, WHOQOL-BREF [HK] posttests), which includes physical, psychological, social, and environmental aspects. In addition, the intervention group also showed a significantly greater improvement in ambulation ability (ie, TUG posttest) with lesser time spent in completing the test. The clients’ improvements in mobility, physical activities of daily living, and instrumental activities of daily living were 24.2%, 16.0%, and 19.3%, respectively. We also used ANCOVA to compare the caregivers’ caregiving strain (ie, CSI posttest) and control for the baseline CSI, age, gender, and educational level. The intervention group’s caregiving strain was significantly lower than that of the control group. Cohen’s guidelines indicated that the values of partial eta-square for small, moderate, and large effects were 0.01, 0.06, and 0.14, respectively.22 Hence, the HBRS of this study demonstrated considerable effects on improving the clients’ mobility, physical, and cognitive functioning, as well as their overall quality of life. HBRS also demonstrated a moderate effect on the reduction of caregivers’ caregiving strain. Notes: aOne-way between-groups ANCOVA with the respective pretest, the client’s CFS score, and educational level being set as covariates in the analysis for the client’s health outcomes (ie, EMS, TUG, MBI, Lawton’s IADL, MMSE, and WHOQOL-BREF [HK]) and the pre-CSI, the caregiver’s age, gender, and educational level being set as covariates in the analysis for the caregiver’s health outcome (ie, CSI). bScores range from 0 to 20 with a higher score representing better mobility. cAdjusted mean score. dTime measured in seconds with a shorter time representing better ambulation ability. eScores range from 0 to 100 with a higher score indicating greater independence in ADL. fScores range from 0 to 16 with a higher score representing greater independence in IADL. gScores range from 0 to 30 with a higher score indicating a better cognitive status. hScores range from 0 to 100 with a higher score indicating a better quality of life overall or in a domain. iScores range from 1 to 5 with a higher score indicating better general quality of life/health. jScores range from 0 to 13 with a higher score representing a higher level of caregiving strain. Abbreviations: EMS, Elderly Mobility Scale; TUG, Timed Up and Go; MBI, Modified Barthel Index; IADL, Instrumental Activities of Daily Living Scale; MMSE, Mini-Mental State Examination; QOL, quality of life; WHOQOL-BREF, World Health Organization Quality of Life Scale, Short Form; ADL, activities of daily living; CSI, Caregiver Strain Index; ANCOVA, analysis of covariance; CFS, Clinical Frailty Scale. 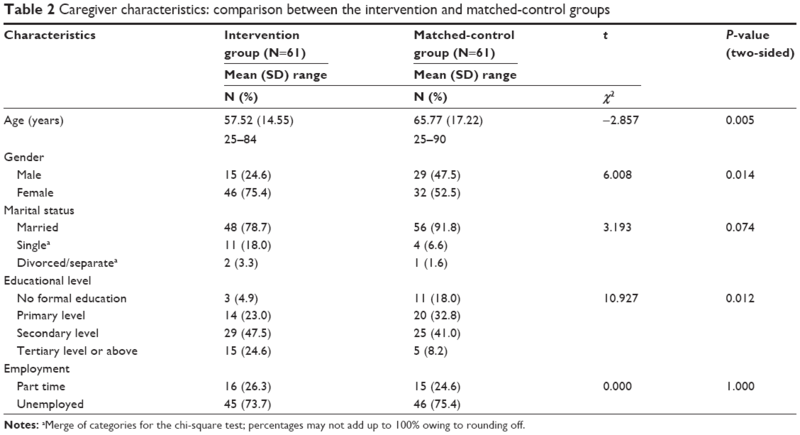 Table 4 shows the comparison results of hospital services utilization between the intervention and control groups. We used ANCOVA to compare the AED attendance, number of unplanned hospital admissions, and bed days and control for the client’s frailty (ie, CFS score) and educational levels owing to the variation between the two groups. The results of the follow-up after 3 months showed that the intervention group had substantially reduced the AED attendance, unplanned hospital admissions, and bed days compared with those of the control group. Hence, HBRS demonstrated moderate to large effects on the reduction of hospital services utilization in the follow-up after 3 months. However, no significant differences between the two groups in any of the hospital services utilization were reported in the follow-up after 6 months. Notes: Hospital services utilization. aOne-way between-groups ANCOVA with the client’s CFS score and educational level being set as covariates in the analysis. bChanges were calculated by subtracting the count of hospital service utilization outcomes 3 months before the HBRS from the count of the hospital service utilization outcomes 3 months after the HBRS. cChanges were calculated by subtracting the count of hospital service utilization outcomes 6 months before the HBRS from the count of the hospital service utilization outcomes 6 months after the HBRS. Abbreviations: HBRS, home-based rehabilitation service; CFS, Clinical Frailty Scale; AED, Accident and Emergency Department. With respect to other health outcome measures for the clients, the intervention group demonstrated a substantial improvement in cognitive functioning (ie, MMSE).22 The findings of the present study are consistent with those of previous home-based rehabilitation studies that also used cognitive status as an outcome measure among mild cognitively impaired or dementia patients.42,43 Improvement in clients’ cognitive status is unsurprising because cognitive and memory training sessions were provided to HBRS clients based on their training needs. In addition, the occupational therapist and rehabilitation assistant of HBRS also taught caregivers how to conduct cognitive and memory training in a home-based environment. This enhancement of the caregivers’ ability to conduct home-based cognitive training for clients may amplify the therapeutic effects. Significant improvements were also observed in all the measurement aspects of quality of life in the intervention group, including the physical, psychological, social, and environmental aspects. Hence, HBRS is potentially effective in improving the clients’ quality of life. In contrast, a multicenter RCT of a home-based physical rehabilitation program for patients just after a critical illness could not demonstrate any significant result on the outcomes of the health-related quality of life.44 This inconsistency between the results on quality of life may be explained by the patients’ subjective experience with a recent critical illness, thereby affecting the patients’ self-evaluations toward quality of life. Results of the hospital services utilization were significant for the short term (3 months), including the frequency of emergency room attendance, unplanned hospital admissions, and unplanned hospital bed days. These results were consistent with those of a previous study on home-based care service for frail elders with high readmission rate in Hong Kong. The previous study demonstrated a significant reduction in the number of unplanned hospital admissions (−1.41±1.23 to −0.77±1.31; P=0.049). However, the results in the frequency of emergency room attendance and unplanned hospital bed days were insignificant in the follow-up after 3 months.45 With regard to the follow-up after 6 months, the results on hospital services utilization could not demonstrate any statistically significant difference. Such insignificance may be related to the fact that the majority of clients did not avail HBRS after 3 months. Moreover, the hospital services utilization after 3 months may be due to health conditions that were unrelated to the clients’ rehabilitation. The HBRS used in this study has demonstrated its positive impact on promoting clients’ short-term health outcomes and reducing their hospital services utilization. The merits of HBRS include establishing networks with both hospitals and community services, adopting a therapist and client mutually agreed treatment plan, and the use of a case management approach. These advantages could be considered the way forward in community HBRS. Additional investigations on the involvement of multidisciplinary healthcare professionals or the use of health care technologies in HBRS are suggested. Stott DJ, Quinn TJ. Principles of rehabilitation of older people. Medicine. 2017;45(1):1–5. Giné-Garriga M, Roqué-Fíguls M, Coll-Planas L, Sitjà-Rabert M, Salvà A. Physical exercise interventions for improving performance-based measures of physical function in community-dwelling, frail older adults: a systematic review and meta-analysis. Arch Phys Med Rehabil. 2014;95(4):753–769. Boland L, Légaré F, Perez MM, et al. Impact of home care versus alternative locations of care on elder health outcomes: an overview of systematic reviews. BMC Geriatr. 2017;17(1):20. Toles M, Colón-Emeric C, Naylor MD, Asafu-Adjei J, Hanson LC. Connect-home: transitional care of skilled nursing facility patients and their caregivers. J Am Geriatr Soc. 2017;65(10):2322–2328. Lockwood KJ, Taylor NF, Boyd JN, Harding KE. Pre-discharge home visits by occupational therapists completed for patients following hip fracture. Aust Occup Ther J. 2017;64(1):41–48. 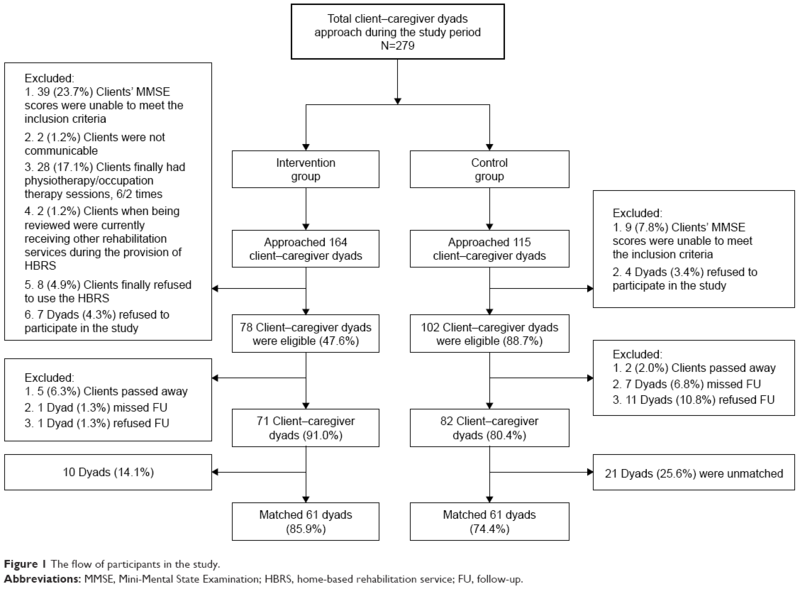 Mas MÀ, Inzitari M, Sabaté S, Santaeugènia SJ, Miralles R. Hospital-at-home Integrated Care Programme for the management of disabling health crises in older patients: comparison with bed-based intermediate care. Age Ageing. 2017;46(6):925–931. Sahota O, Pulikottil-Jacob R, Marshall F, et al. The Community In-reach Rehabilitation and Care Transition (CIRACT) clinical and cost-effectiveness randomisation controlled trial in older people admitted to hospital as an acute medical emergency. Age Ageing. 2017;46(1):26–32. Karlsson Å, Berggren M, Gustafson Y, Olofsson B, Lindelöf N, Stenvall M. Effects of geriatric interdisciplinary home rehabilitation on walking ability and length of hospital stay after hip fracture: a randomized controlled trial. J Am Med Dir Assoc. 2016;17(5):464. Bongartz M, Kiss R, Ullrich P, Eckert T, Bauer J, Hauer K. Development of a home-based training program for post-ward geriatric rehabilitation patients with cognitive impairment: study protocol of a randomized-controlled trail. BMC Geriatr. 2017;17(1):214. Bradford NK. Enhanced rehabilitation and care models for adults with dementia following hip fracture surgery. Orthop Nurs. 2016;35(3):187–188. Stolee P, Lim SN, Wilson L, Glenny C. Inpatient versus home-based rehabilitation for older adults with musculoskeletal disorders: a systematic review. Clin Rehabil. 2012;26(5):387–402. Ellis G, Whitehead MA, Robinson D, O’Neill D, Langhorne P. Comprehensive geriatric assessment for older adults admitted to hospital: meta-analysis of randomised controlled trials. BMJ. 2011;343:d6553. Oerkild B, Frederiksen M, Hansen JF, Prescott E. Home-based cardiac rehabilitation is an attractive alternative to no cardiac rehabilitation for elderly patients with coronary heart disease: results from a randomised clinical trial. BMJ Open. 2012;2(6):e001820. Ytterberg C, Thorsén AM, Liljedahl M, Holmqvist LW, von Koch L. Changes in perceived health between one and five years after stroke: a randomized controlled trial of early supported discharge with continued rehabilitation at home versus conventional rehabilitation. J Neurol Sci. 2010;294(1–2):86–88. Crotty M, Giles LC, Halbert J, Harding J, Miller M. Home versus day rehabilitation: a randomised controlled trial. Age Ageing. 2008;37(6):628–633. Anderson C, Rubenach S, Ni Mhurchu C, Clark M, Spencer C, Winsor A. Home or hospital for stroke rehabilitation? Results of a randomized controlled trial. Stroke. 2000;31(5):1024–1034. Park SG, Oliver P, Pennington M, et al. Rehabilitation of older patients: day hospital compared with rehabilitation at home. A randomized controlled trial. Health Technol Assess. 2009;13(39):1–143. Folstein MF. The Mini-Mental State Examination. In: Crook T, Ferris S, Bartus R, editors. Assessment in Geriatric Psychopharmacology. Vol 40. New Canaan: Mark Powley; 1983:812–851. Geriatric Medicine Research Unit, Dalhousie University. Clinical Frailty Scale; 2012. Available from: http://geriatricresearch.medicine.dal.ca/clinical_frailty_scale.htm. Accessed June 12, 2014. Chan DC, Tsou HH, Chen CY, Chen CY. Validation of the Chinese–Canadian study of health and aging clinical frailty scale (CSHA-CFS) telephone version. Arch Gerontol Geriatr. 2010;50(3):e74–e80. Zidén L, Frändin K, Kreuter M. Home rehabilitation after hip fracture. A randomized controlled study on balance confidence, physical function and everyday activities. Clin Rehabil. 2008;22(12):1019–1033. Cohen JW. Statistical Power Analysis for the Behavioral Sciences. 2nd ed. Hillsdale: Lawrence Erlbaum Associates; 1988. Smith R. Validation and reliability of the elderly mobility scale. Physiotherapy. 1994;80(11):744–747. Yu MS, Chan CC, Tsim RK. Usefulness of the elderly mobility scale for classifying residential placements. Clin Rehabil. 2007;21(12):1114–1120. Norén AM, Bogren U, Bolin J, Stenström C. Balance assessment in patients with peripheral arthritis: applicability and reliability of some clinical assessments. Physiother Res Int. 2001;6(4):193–204. Shah S. Modified Barthel index or Barthel index (expanded). In: Salek S, editor. Compendium of Quality of Life Instruments, Part II. Chichester: Wiley and Sons; 1998. Tong AYC, Man DWK. The validation of the Hong Kong Chinese version of the Lawton instrumental activities of daily living scale for institutionalized elderly persons. OTJR. 2002;22(4):132–142. Huang WF, Chen PY. Activities of daily living and instrumental activities of daily living. In: VWQ Lou, Boey KW, editors. Handbook of Measures for the Chinese Elderly. Hong Kong: Sau Po Centre on Ageing, The University of Hong Kong; 2008:39–43. Chiu HF, Lee H, Chung W, Kwong P. Reliability and validity of the Cantonese version of mini-mental state examination – a preliminary study. Hong Kong J Psychiatry. 1994;4(2):25. Leung KF, Wong WW, Tay MSM, Chu MML, Ng SSW, Ng S. Development and validation of the interview version of the Hong Kong Chinese WHOQOL-BREF. Qual Life Res. 2005;14(5):1413–1419. Chan WC, Chan CL, Suen M. Validation of the Chinese version of the modified caregivers strain index among Hong Kong caregivers: an initiative of medical social workers. Health Soc Work. 2013;38(4):214–221. Kool J, Oesch P, Bachmann S. Predictors for living at home after geriatric inpatient rehabilitation: a prospective cohort study. J Rehabil Med. 2017;49(2):185–190. Donohue K, Hoevenaars R, Mceachern J, Zeman E, Mehta S. Home-based multidisciplinary rehabilitation following hip fracture surgery: what is the evidence? Rehabil Res Pract. 2013;2013:875968.
de Morton NA, Berlowitz DJ, Keating JL. A systematic review of mobility instruments and their measurement properties for older acute medical patients. Health Qual Life Outcomes. 2008;6:44. Hsieh YW, Wang CH, Wu SC, Chen PC, Sheu CF, Hsieh CL. Establishing the minimal clinically important difference of the Barthel index in stroke patients. Neurorehabil Neural Repair. 2007;21(3):233–238. Ministry of Health, Singapore. Manual for Providers of Community Rehabilitation Services; 2010. Available from: https://www.moh.gov.sg/content/dam/moh_web/Publications/Guidelines/Step%20down%20care/2010/Manual%20for%20Community%20Rehabilitation%20Provider%20MOH%20_Final.pdf. Accessed December 2, 2017. Lee FI, Lee TD, So WK. Effects of a tailor-made exercise program on exercise adherence and health outcomes in patients with knee osteoarthritis: a mixed-methods pilot study. Clin Interv Aging. 2016;11:1391–1402. de Vos BC, Runhaar J, Bierma-Zeinstra SM. Effectiveness of a tailor-made weight loss intervention in primary care. Eur J Nutr. 2014;53(1):95–104. Yuill N, Hollis V. A systematic review of cognitive stimulation therapy for older adults with mild to moderate dementia: an occupational therapy perspective. Occup Ther Int. 2011;18(4):163–186. Kurz A, Pohl C, Ramsenthaler M, Sorg C. Cognitive rehabilitation in patients with mild cognitive impairment. Int J Geriatr Psychiatry. 2009;24(2):163–168. Elliott D, Mckinley S, Alison J, et al. Health-related quality of life and physical recovery after a critical illness: a multi-centre randomised controlled trial of a home-based physical rehabilitation program. Crit Care. 2011;15(3):R142. Han Y, Liu Y, Zhang X, Tam W, Mao J, Lopez V. Chinese family caregivers of stroke survivors: determinants of caregiving burden within the first six months. J Clin Nurs. 2017;26(23–24):4558–4566. Swinkels J, Tilburg TV, Verbakel E, Broese van Groenou M. Explaining the gender gap in the caregiving burden of partner caregivers. J Gerontol B Psychol Sci Soc Sci. Epub 2017 Apr 3. Wong FK, Chow SK, Chan TM, Tam SK. Comparison of effects between home visits with telephone calls and telephone calls only for transitional discharge support: a randomised controlled trial. Age Ageing. 2014;43(1):91–97. Pol MC, Ter Riet G, van Hartingsveldt M, Kröse B, de Rooij SE, Buurman BM. Effectiveness of sensor monitoring in an occupational therapy rehabilitation program for older individuals after hip fracture, the SO-HIP trial: study protocol of a three-arm stepped wedge cluster randomized trial. BMC Health Serv Res. 2017;17(1):3. Lorig K, Ritter PL, Laurent DD, Yank V. Building better caregivers: a pragmatic 12-month trial of a community-based workshop for caregivers of cognitively impaired adults. J Appl Gerontol. Epub 2017 Nov 1.